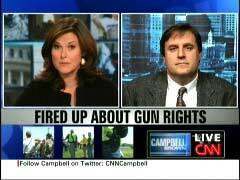 On her CNN program on Monday, Campbell Brown forwarded one of the Left's talking points about the tea parties by stating that "it does appear that we are seeing a rise in right wing extremism recently." However, her guest, historian Robert Churchill of the University of Hartford, downplayed her claim and claimed that groups like the Southern Poverty Law Center were "exaggerating" the threat. Brown brought on Churchill at the bottom half of the 8 pm Eastern hour. Midway through the interview, she made her "right wing extremism" claim and cited "a number of studies that have looked at this. The Department of Homeland Security came out with a study last year saying that, perhaps, it's the economy, or possibly the President's race." The anchor then asked, "What do you see as driving recruitment right now, beyond just sort of the generic more- or not generic, but more general libertarian view?" CHURCHILL: Well, I think we have to really be careful to distinguish what's going on on the right end of American politics right now. It is absolutely correct that there's a lot of activity in what I'd call the Christian patriot public sphere, that is to sort of say, that part of the political spectrum that kind of casts out beyond the mainstream. There's lots of political organizing going on. There's lots of groups that are emerging or old groups that are getting stronger again. One of the new groups is... [the] Oath Keepers. One of the older groups that, apparently, is picking up steam again is the John Birch Society, which has been around for a long time, but apparently is enjoying a resurgence. All of this is political organizing and I don't see it as being particularly threatening. Brown reacted to Churchill's answer with some surprise: "You don't? That was going to be my question. Are there examples- I mean, there aren't real examples but we- you know, this is also the anniversary of the- you know, bombing in Oklahoma City. So that has a lot of people thinking about this....Does that worry you?" CHURCHILL: Well, I mean, I guess there are things to be concerned about, but I think we have to pay attention to the right things. We have had a tendency in the last 10 years to be really very concerned about insurgent violence, and sometimes what we forget is that state-sponsored violence can be much more devastating. It seems to me that we do have some degree of revival in the militia movement, which emerged in the 1990s, and then really went dormant during the Bush administration. We do see some increase in the numbers of militia groups, but nothing close to what was happening in the 1990s. So, there again, I think that although there are- you know, groups like the Southern Poverty Law Center that are sort of ringing the bells of warning, I think they're exaggerating the actual degree of what's happening out there. This is quite a statement from a CNN guest, as the network regularly turns to the Southern Poverty Law Center to forward their claims about the supposed revival of "right wing extremism." CNN.com cited the SPLC less than a month ago on March 30 after the arrest of the members of the Hutaree militia in Michigan. In November 2009, correspondent Jim Acosta rehashed a study from the liberal organization during a report about militias. Earlier that year, on August 20, anchor Rick Sanchez brought on the group's Mark Potok, and the two agreed that there was a "disconcerting" infiltration of militia groups into the tea party protests. BROWN: It is striking...[at] one rally in Virginia, demonstrators were carrying guns openly, which is legal there, but very much an in- your-face kind of demonstration- not the first time either that we have seen this kind of thing. CHURCHILL: Well, and that's right- I mean, and I think there's a couple of things going on there as well. It seems to me that for some folks in the gun rights movement, they're really trying to bring back an earlier era in American politics in which guns were actually a normative part of the practice of politics. If you look at this country's history in the late 18th century and the early 19th century, a lot of politics revolved around militia musters where guns were present. Guns were a part of political festivity....and I think they're trying to bring that back.